won a Bronze Bike Friendly Business Award this year. Photo: John Sturr, Sturr Photography 2013.
Who better to design an environment fit for bicycling than architects? While other architecture firms around the country have been honored as Bicycle Friendly Businesses (BFB) over the last five years by the League of American Bicyclists (LAB), it took until now for a Utah firm to win the honor. At least 11 other architectural firms around the nation have earned BFB status since the program started in 2009, including landscape designers and planners. When asked why architects are so interested in cycling, staff at FFKR and Alison Dewey, league BFB program manager, said they could only speculate. Ken Louder, outgoing president of FFKR suggested that maybe “architects are kind of drawn to simple elegant machines. So disproportionate numbers are cyclists.” Louder retains quite a personal interest in cycling, as he races regularly. He also instilled the bug in his son Jeff, who races professionally for the United Healthcare Pro Cycling Team. Still, he insists that the 119-employee company's interest in becoming a BFB was a team effort. The company has been promoting bicycling for a decade. “We just waited till now to get the plaque for the wall,” Louder says. 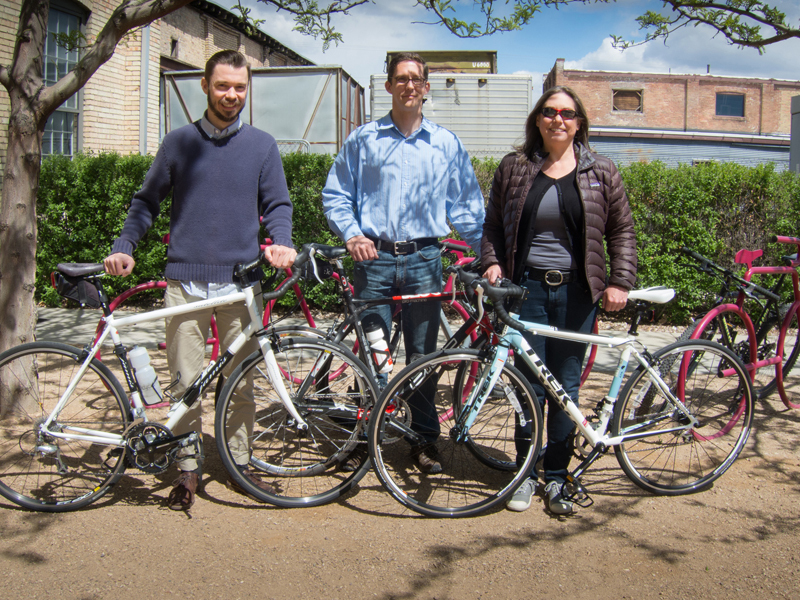 LAB praised FFKR's Bike to Work Challenge, in which its employees logged 2,612 miles on 445 rides during warm weather months last year. FFKR provides secure bike parking behind a locked gate and employees can even bring their bikes inside and park them by their desk. The firm also provides lockers and showers, which league evaluators always like to see. FFKR also offers quarterly bike safety classes – at lunch time because people don't want to stay after work. FFKR also sponsors a racing team (FFKR/Velosport Racing), which makes good marketing sense. “We get a lot of positive comments from clients and associated professionals who say ‘I saw you guys riding,'” Louder notes. The company also offers employees a guaranteed ride home if they bike to work but can't make it home. Knowledgeable employees will help you with a flat. “We have company cars people can check out overnight,” notes FFKR Marketing Coordinator Heidi Nielsen. “Probably none have used it but it is available,” she says with a laugh. Generally, when people can't bike home because of weather or a cycle-related problem, they can take their bikes home on public transit. And how to climb the ladder to a higher BFB rank? Nielsen acknowledges “we need to increase ridership. We just need to encourage people to ride the two miles to work.” FFKR may also increase its quarterly class offerings because not everyone can attend offered dates. The 65-year-old Louder, meanwhile, is looking forward to his pending retirement “so I can ride my bike more. I'll probably compete more,” he says. Meanwhile, up in Boise, Idaho – a town already designated as a Silver Level Bicycle Friendly Community – a town where Boise State University was awarded Silver Status as a Bicycle Friendly University – a town where the six-year-old Boise Bicycle Project (BBP) actively is trying to make Boise “the cycling capital of the U.S.” – a town working on opening a bikeshare program soon – a town with nine previously awarded BFBs – three more earned bronze status this spring. The Central District Health Department (CDHD), St. Luke's Health System and the Treasure Valley Family YMCA Downtown Branch all joined the rank. LAB was impressed that Central District offers cash incentives for those who ride to work regularly, sponsors a maintenance clinic, includes bicycling in its wellness celebration and provides info on safe bicycling and routes to work, Dewey states. During May in Motion, those who use alternate transportation to work get cash rewards funded out of vending machine proceeds, explains department public information officer Dave Fotsch. If you use alternate transportation eight times in May, you get $5, 14 times $10 and 20 times $20. Qualifying commutes include “carpooling, walking, Rollerblading, cycling, pogo stick,” Fotsch says. The overall champ gets a $50 gift certificate at a local store. “I wish we could extend it year round but we don't have the resources,” Fotsch explains. The league also noted that CDHD Deputy Director Cindy Trail serves as BBP president. One thing the department needs to do to climb the BFB ranks is to improve parking. Its racks aren't covered, Dewey says. It also lacks locker and shower facilities. “That would be pretty easy for us to address,” Fotsch acknowledges. Meanwhile, Boise's downtown YMCA won honors for sponsoring a variety of clubs, focusing on everything from triathlons for youth and adults to “Cycling Sisters” rides for women with or recovered from cancer. A bike lane takes you right up to the building. Finally, St. Luke's Health System impressed the league judges with the $40 coupon for local bike stores it gives employees who bike to work at lest 60 percent of the time during the half of the year when weather is most conducive to riding. The league also liked St. Luke's commuter breakfast and other support for Bike to Work Day, May in Motion commuter rides, bike team sponsorships and support for the Southwest Idaho Mountain Biking Association. In spring, St. Luke's offers a day or two when people can bring in their bikes for a tune up, says Wellness Coordinator Mary Powell. But the hospital system dropped its cycling club. “That never did take off to the level we'd hoped. It was a smaller group of people. Working in a culture where it is 24/7 (and) schedules vary so greatly, it is tough to get consistent groups,” Powell says. “They could encourage more commuting,” Dewey notes.